From address that should appear on the confirmation emails. CC or BCC email addresses (up to 4 each) that should get a copy of the email for record keeping purposes. The SMTP settings are found in the file "inc_variables.asp", inside the WebRes installation folder. If we have remote access to the server we can modify these settings for you, otherwise someone with access will have to do it. We don't know what your SMTP login information is and don't have any way to obtain it. Please contact your IT or your email provider to obtain this information. 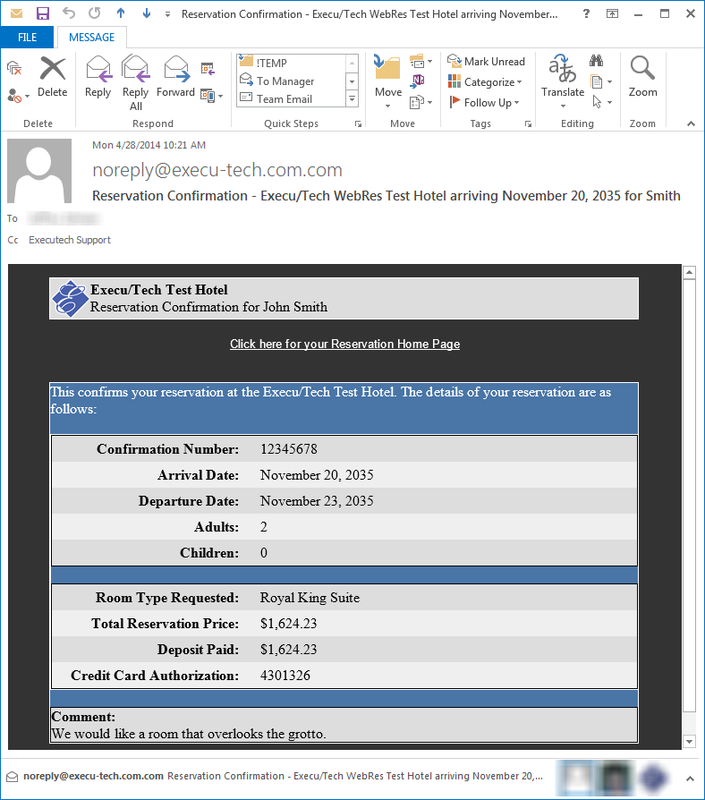 If you’re going to use the hotel's IIS for SMTP relay, be sure properly configure a ‘Remote’ domain under the Default SMTP Virtual Server. Without this ‘Remote’ domain, emails will not send. This is the extent of the information we will provide relating to configuring your own SMTP server. After you're confident the SMTP settings are correct, you can test WebRes emailing by following the instrutions at the bottom of this page. Since the confirmation email will be displayed in a variety of email clients, it's best to make it as simple as possible. Different email clients will render html and styles differently and what looks good to you may not look good to someone else. Images and too many nested elements (tables, div, etc.) might not look the same and some styles are ignored completely. The confirmation page and confirmation email files are both located in the WebRes folder. Both of them use the same dynamic tags. These are the dynamic tags that can be used in both templates. Place them wherever you want to show the specified information. The total price for the reservation. 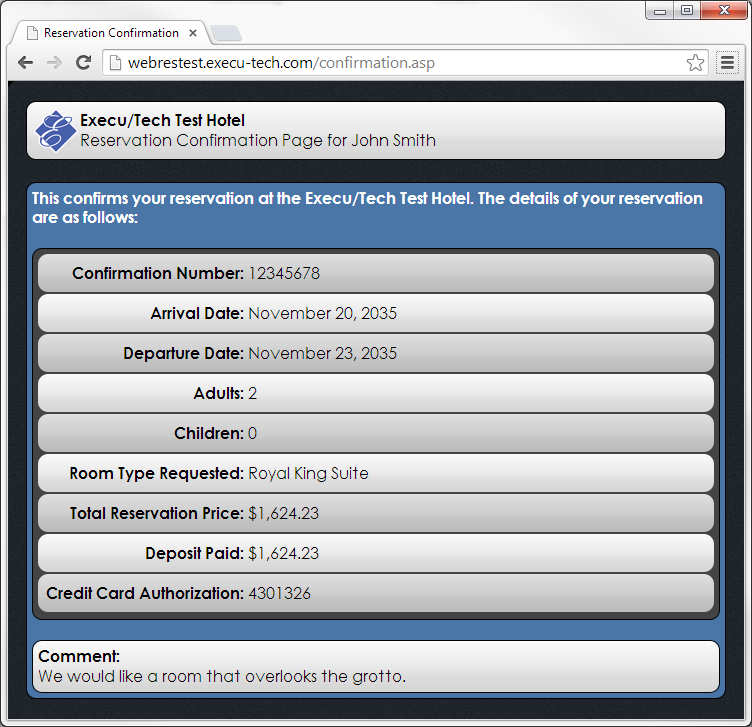 The total deposit required for the reservation. The authorization response from the processor. The comment that the guest entered. The room type that the guest requested. To help you with modifying the confirmation page and email templates, we provide a test page that allows you to send yourself a confirmation email and review the confirmation page. This is the same confirmation page and email that the guest will see. To access this test page, enter the URL for your WebRes installation and replace "webres.asp" with "testemail.htm". Enter your email address in the text field and click "TEST".